If you have build any content management system or any other system in which you have use CKEDITOR HTML editor. So, Now you want to upload Image from CKEDITOR using PHP script. For this here we have make this post, in which we have step by step describe how to make custom image upload in CKEDITOR from your PHP application. We all know CKEDITOR is a widely used HTML editor in any web based application, and it is very easy to use, and it is very easy to integrate in our application. Suppose you have used CKEDITOR in your web application, then by default for add image into your content, you have to just add upload image path into image dialog box and you can adjust property of image. But you cannot direct upload image from your local computer into text editor. For upload image or file in CKEDITOR, there are two way you can upload image in CKEDITOR, first you have to use any plugin for upload image in CKEDITOR or you have to make custom image upload in CKEDITOR. Here we have discuss, how to make custom image upload in CKEDITOR using PHP script. For make custom image upload in CKEDITOR, you have to follow following steps. If you want to use CKEDITOR into your PHP web application, then first you have to download CKEDITOR from it's official site or even you can directly use cdn for CKEDITOR for it's official site also. Suppose you have done download CKEDITOR or use cdn of CKEDITOR in your application, For this here we have make index.php file. In this file we have make simple html code of textarea field. Below you can check how to integrate CKEDITOR in textarea html field and after integrate CKEDITOR it will convert into textarea field. In this HTML code we have use cdn of CKEDITOR for integrate into our application. Once you have done integrate CKEDITOR into HTML code, and enable upload tab in image dialog box. Now you have to make PHP script for upload selected image from local computer to upload folder and send uploaded image request back to CKEDITOR image dialog box. For this source code you can find below. 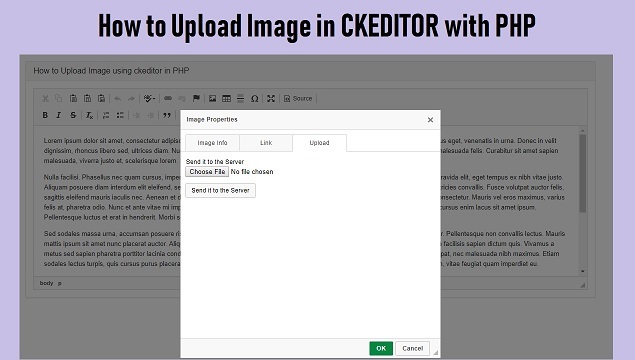 This is complete step by step process for how to integrate CKEDITOR in PHP application, how to enable upload tab in CKEDITOR image dialog box and how to upload image in CKEDITOR using PHP script. Awesome tutorial sir. Please make a video on how to create product variations with different prices and quantities for the same product in PHP or Codeigniter. Exactly like Wordpress woo-commerce product variations.